Administrators required all U.S. Government students to take the Government High School Assessment May 22. In previous years, administrators expected only honors and on-level Government (NSL) students to take the HSA the same year they took the course, while AP students who scored below a three on the AP exam took the HSA the following year. The number of last year’s AP students who took the HSA at the beginning of this school year because they received a one or two on the AP exam is unknown to social studies department head Suzy Johnson. Administrators changed this requirement in order to prevent those who did not pass from having to take it next year, assistant principal Rainer Kulenkampff said. The Maryland State Department of Education requires that students either pass the Algebra 1, Biology, English 10 and U.S. Government HSAs or earn a sufficient combined score between all of them in order to graduate. But students who score a three or higher on the AP U.S. Government exam can receive an exemption from MCPS for the related HSA. MCPS strongly suggests, but doesn’t require, that AP NSL students take the HSA in the same year they take NSL because students don’t find out their AP scores until mid-July, and don’t know until then if they qualify to be exempt from the Government HSA. 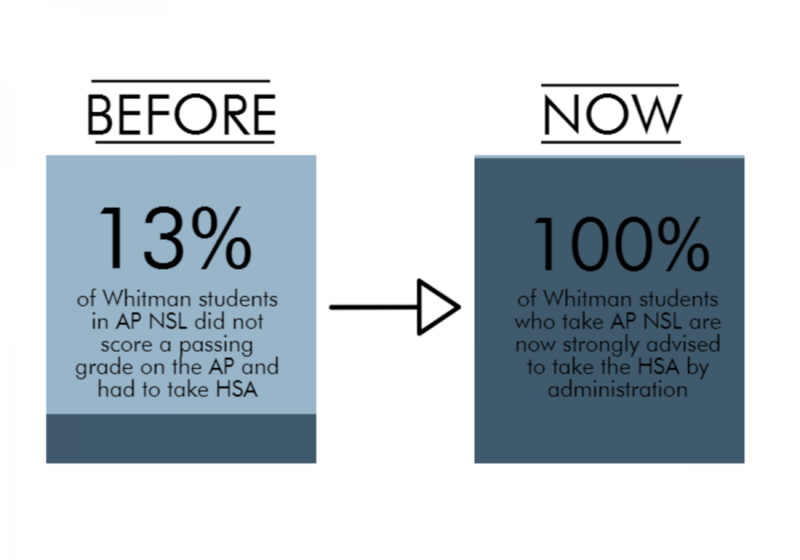 Students who already took the AP NSL exam May 4 expressed frustration over the change. Though AP students voiced annoyance about having the take the HSA, the test doesn’t cover the material in as much depth as the AP. Performing well on the Government HSA can also help a student achieve a higher combined HSA score, potentially outweighing a poor score on a different HSA, principal Alan Goodwin said.